PERSON OF INTEREST took a little bit of a detour from the looming wars with the last episode as Reese set out to solve one of Carter’s unfinished cases (and he nearly died in the process). But as we approach the final two episodes of the season, things are about to explode. “As usual, we get to the end of the season, [and] we like to break things,” PERSON OF INTEREST co-showrunner Jonathan Nolan laughed. And with those broken things to come, some familiar faces won’t make it out of the season alive. 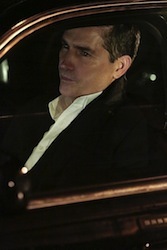 This week’s new episode of PERSON OF INTEREST is an emotional hour, as Reese sets out to solve a case Carter was never able to close before her untimely death. As the show underwent its deep-dive into Reese’s mindset, the flashbacks also allowed the series to use Taraji P. Henson (Carter) — who has been having a busy year between EMPIRE and her SNL hosting gig this past weekend — for the first time since her 2013 exit.